Dragon and Jennifer travel to a region of Chicago that has come to be known as the Danger Zone. As the city’s rebuilding has spread out, this is the one remnant left of previous savage world and has become a haven of many lawless super-freaks. William Jonson and Rita Medermade moved to the Danger Zone to help police it and their friends had come to visit them. The Rats launch an assault upon the incoming heroes, forcing them out of their hover car. The Rats are eventually driven off due to the combined might of the married couple who then stumble across a badly beaten Star. William explains that his girlfriend has been taken before he gets rushed to hospital for emergency treatment. Rex Dexter is consulted on the matter but he can think of nothing that would assist in a search. Jennifer brings up the fact that Rita has been exposed to both the Martian enlarging and shrinking rays and has presumably undergone some kind of genetic mutation. Whilst Rex works on something using this theory, the rest of the Liberty League take to the streets and interrogate as many people as possible in the Danger Zone. It appears that no one is privy to Rita’s location and the heroes start to get worried. They are then approached by an elf that claims to work for Santa Claus and has need of their help. It seems that his employer has been abducted and Dragon is asked if he will fill in for him, delivering the presents on Christmas Eve. In return for this act, the thousands of elves will join the search for Rita. Dragon takes his family to the North Pole where they are explained how the gift delivering process works which involves magic slowing down time. With their time occupied, the rest of the Liberty League continues their search and Battle Tank has concocted a device that he thinks will help. He sends out low frequency waves from his armor that will hopefully react with Rita’s unique physiology. This plan succeeds and Rita grows to huge proportions which unfortunately unleashes animalistic urges. She nearly crushes Gallant to death as payback for the Rats’ kidnapping of her. The delivering process commences but before Dragon even reaches his first house; the sleigh comes under attack from the Seeker. The silent assassin battles with the hero who punches at Seeker’s glider which blows it up, taking off his fist in the process. Jennifer starts throwing gifts at the villain which distracts him momentarily. The Seeker shoots off Dragon’s other hand before he is punted down to the ground below, leaving him stranded in the middle of the snow covered Danger Zone. 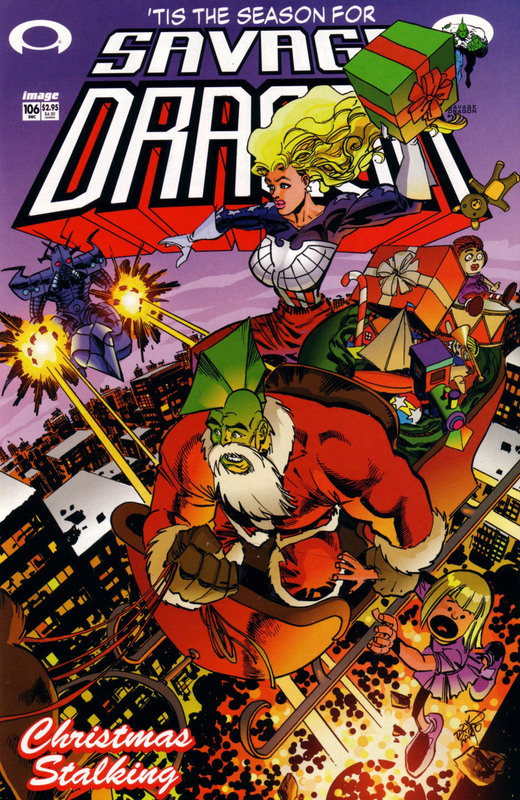 With his hands hampering his abilities, the elves relieve Dragon of his new responsibilities and the terrorists that had abducted Santa are thwarted by the superhero Omni-Man. This frees up Dragon to host a Christmas Party at his home. Rita has gained the ability to alter her size at will as a result of Rex’s machines reacting with the Martian technology. Jennifer feels bad over the fate of the Seeker being left all alone but Dragon assures her that he is fine as people like that always seems to survive.